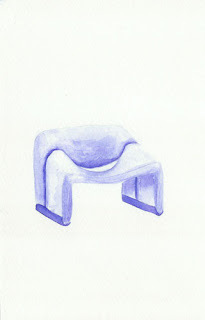 French designer Pierre Paulin was a well-known figure in the world of design for over half a century. Born in paris on July 9, 1927, Paulin was influenced by Japanese drawing and American designers Charles and Ray Eames. When Paulin designed the F 598 chair in 1973, it quickly became the darling of the avant-garde. This and other designs of his found their way into major museums across the world such as the New York's Museum of Modern Art, the Museum of Decorative Arts in Paris, and London's Victoria and Albert Museum. His work even found its way into the presidential palace! Being a favorite designer to former French Presidents - Georges Pompidou and Francois Mitterrand, they chose him to furnish. Trés chic! He died at the age of 81 on June 14th of this year in Montepellier, France.